We left Chiltepe for Grenada in the early afternoon and passed the outskirts of Managua. We have heard bad things about Managua and had little desire to hang around and see if they were correct. Taking the Masaya highway around Managua, we drove down a road with huge metal-yellow trees. I think it's a Sandinista thing with Daniel Ortega. They were cool none the least and can see pictures in the Gallery. We made it through Managua and on or way past the Masaya Volcano which was nearly covered in clouds making it impossible to see its magnificence. We arrived in Granada and liked it more then Leon. It wasn't as grungy and dangerous feeling but, we still had issues with parking the vehicle and decided to sit at a cafe downtown, have a coffee and possibly get some internet to see what Hotels.com says. We parked the car on the street and entered a nice little courtyard cafe and we sat there people watching and drinking our coffee milkshakes. We found out on hotels.com that the cheapest place was near 70 dollars except for hostels which probably don't have parking. The colonial cities in Nicaragua don't typically have parking space. The homes are literally packed into one cement block of doors and gates, but little room to park. We drove down to Lake Nicaragua and saw the coast road and even found a Walmart, but no place to stay with parking. We drove down the coast end even drove down to the water's edge on the beach. There were some horses grazing and drinking on the beach and families BBQ'ing in the back of their pickups and minivans. We saw a hotel right across the street from a park on the shore of Lake Nicaragua and decided to check it out. It was relatively inexpensive at 4o dollars, including breakfast. It had a small gated parking area which was only about 10 feet from an outdoor reception and we decided to stay the night. The room was with a/c and the smallest T.V. I have seen in a room. It suited us perfectly. We settled in and took a taxi to the central area to get some street food. We hear it's a little dangerous in Granada at night and to only stay where people are and take taxis. Taking a taxi to the center of town, we walked around in search of street food. There was nothing but hamburger and hot dog stands. This bothers us a little. I understand when a place is deemed a tourist area, but if you are only selling American Junk food, it seems a little overdone. Similar to when we used to hire gardeners from the home depot parking lot and assume always, that they want a burrito for lunch. We walked all over town and finally decided on some restaurant which was quiet and showing the Mayweather vs. Pacquiao later on that night. The preliminaries were on the tube and we ordered of course hamburgers and french fries. I think it would have been better to buy them on the street as the food in the restaurant was one of the worst burger and fries I have ever had. We ate our food and left the restaurant and headed to the "Walking Street" where every bar and restaurant had big screen projectors showing the fight. We people watched a little and continued walking home that night down the main boulevard. It was well-lit and except for a few passing cars we saw only a few other people out. We stopped by a some monuments near the coast and our hotel and took some pictures. It was the Ruben Dario monument, who is from Granada, and the Monument to Francisco Hernandez de Cordoba (Spain), the founder of Granada. We retired to our room and watched the fight in Spanish on our tiny television, which was obviously rigged. We woke up the following day and had the "tipico" Nicaraguan breakfast of tortillas, refried beans, slice of stinky cheese, and some eggs, and headed out-of-town for San Juan Del Sur. It was Saturday, and the Sunday Funday Pool Crawl was the next day. We wanted to check out San Juan Del Sur and see what it was all about. 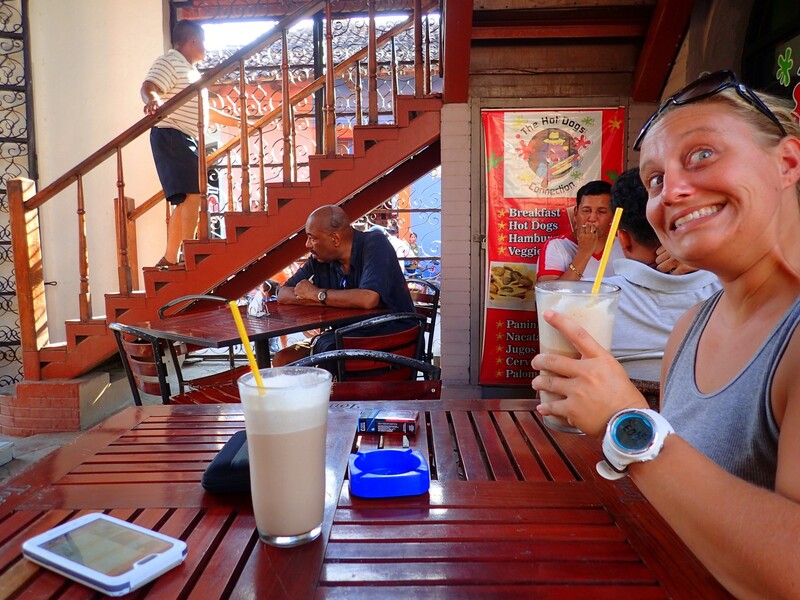 We passed through Rivas, Nicaragua on the way around Lake Nicaragua and got some iced coffees at Burger King and hit the road heading west from the main highway south. The landscape was dry and arid here and as we arrived into the city of San Juan Del Sur, we were pleasantly surprised at its charm and beauty on the bay of the pacific coast. We searched for a hotel with parking and finally found one at 40 dollars U.S. which included a breakfast. We hoped the breakfast was better here than Granada. The room had a ton of charm that almost made it feel like we were in a cabin. It had A/C and a regular sized television and the parking made this place in the center of town ideal. We ventured out to the city and walked down the to the beach to people watched and watch a great sunset. It was great to be in SJDS and It's already our favorite place in Nicaragua. The next day we woke up at a delicious breakfast at the hotel and hung around. Around 2pm we noticed a bunch of younger people walking down the main road near the beach and realized it was the NakedMamma (Pacha Mamma and Naked Tiger Hostels) Sunday Funday Pool Crawl. We had heard of this from our friends Kira and Allie who said it was a great time and also from our friend we met in Roatan who lived in SJDS most of the year. We ended up finding the pool where the party was happening and jumped the short retaining wall to the pool area of a hotel where the DJ was playing and people were dancing, drinking heavily and swimming in a pool too small the for the amount of people. Shelly and I sat down and people watched, spoke to travelers and vacationers from all over the globe and around 5:30pm everyone started lining up to get a shuttle to the next pool called the Naked Tiger. We remember seeing this place outside of town and wondered if we hadn't found the place we did, they would probably have somewhere to park. Since we didn't have the wristband to get on the shuttle, we didn't follow the party, but heard that everyone would be shuttled back down to the Arribas Bar around 7 or 8pm. We went back to the hotel and finished up the lasagna we had made when before leaving Honduras, and headed down to the beach where the Arribas Bar was and we were a bit early for the party so we enjoyed an ice cream at the Eskimo Ice Cream Parlour on the beach next door. We sat and people watched at Arribas when people finally showed up and called it a pretty early night. Although we didn't party, we enjoyed the people watching all day and night with the Sunday Funday Pool Crawl. San Juan Del Sur has a great vibe we were missing in other places we visited in Nicaragua and were glad to have spent a couple of days there. We were near the Costa Rican Border and wanted to cross the next day so we went home and got to bed fairly early for our standards to get a good jump on the next day. We are getting older. This is something that is painfully clear when we spend time at an event like the Sunday Funday Pool Crawl. The 20 something crowd partied and we watched with voyeuristic longing that we were younger. Is getting older a bad thing? Not really. We were able to people watch and participate in the pool crawl in a limited capacity. Although we weren't partying, it was great to be around the youthful attitudes and remember the days past when we were that age. Getting older isn't a negative. The older we get, the more we realize how the wisdom we have gained actually allows us to have fun in an atmosphere where others need to drink and party to have fun. We can simply sit and people watch. Be a bystander watching guys try to pick up girls and girls working to get the attention of boys. It's a game that we are glad we are no longer playing. A game at times, we wish we were still young enough to participate in, however in many ways, glad that those days are over for us. Being young is a state of mind. We have learned to surround ourselves with youth and while traveling. We are at times much older than those we are hanging out with. Does it mean we need to be immature and do the same things the younger crowd is doing? No. In fact, it just means we still hold a zest for life that the youth have and enjoy being part of that zest. We try to assimilate ourselves in the point of view or perspective that we are have our whole lives ahead of us and that it's ok to let go and enjoy life Worrying about the future and the limited time we have as we get older is a deterrent for living life to the fullest. We prefer to live life like there is no tomorrow and even though tomorrow will come, today is what matters because we have our whole lives to look forward to.